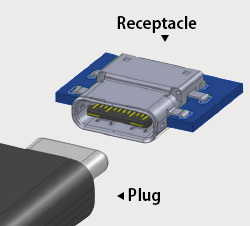 USB Type-C™ Connector | JANDC CO.,LTD. Mass production of USB Type-C connector parts is available!! Compatible to both plug and receptacle! 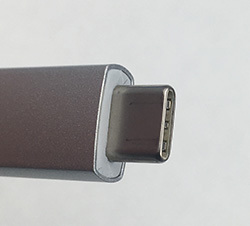 The USB Type-C connector attracts worldwide attention as a future generation of USB connectors. 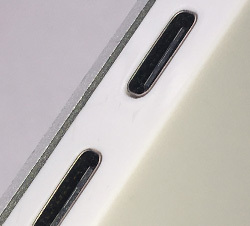 For next generation smartphones and various connectors, standardization of Type-C connectors is progressing and it is expected that they will become more popular in the future. Prior to this demand, JANDC manufactures and sells C-type connector parts. From power supply to video output is possible with one cable. A connector to be attached to a cable is called a plug (male), and a connector to be attached to a smartphone, a personal computer, etc. is called a receptacle(female). We can handle both of these products. Point02Because of Deep-Drawing the connection part gets smooth surface without concave /convex. Point03We have precision processing technology of drawing dies and can respond to mass production. Currently, many metal shell products are made by curling flat plates and caulking the joints, but our press parts are characterized by being manufactured by drawing process. Drawing is one of the metal plate forming methods, which is a processing method for making a container with a bottom such as a cylinder, a square tube, a cone, etc. from a thin metal plate. It is characterized by no seams in the molded product. We manufacture our products using the most advanced molding technology as follows. LIMS is an abbreviation for Liquid Injection Molding System. It means a molding processing system realized by combining liquid silicone rubber with excellent properties and a molding machine that precisely and stably injects this.